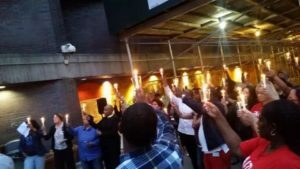 In a moving candlelight vigil outside our New York crisis shelter, our kids joined with staff and local religious leaders to stand side by side in spirit with the families of the Orlando victims. Shakeema North of Covenant House then read the names of the Orlando victims as the streets of New York City became eerily silent. “I can’t say for certain why people choose to hate; why people choose to kill; and why people are void of love,” said Shakeema after reading the names of the victims. “But the one thing I know for sure was that regardless of race, religion, sexual orientation and gender identity, God’s children are not disposable.